Why isn’t this widescreen? It’s so obvious. Because it’s a general-purpose computer that can be used in both portrait and landscape orientations. The screen would be too tall and skinny in portrait mode if it were widescreen in landscape mode. That’s so obvious. I guess Thurott doesn’t remember Radius. Back before anybody else made large monitors for personal computers, Radius came out with the Full Page Display, a portrait-orientation greyscale monitor for the Mac. This made it possible to view and edit a full letter-size page, which was a godsend for page layout. Beautifully-designed monitor that could rotate 90° on-the-fly. The desktop would automatically reorient itself for the changed aspect ratio. I worked with one of these for a couple of weeks in the early ’90s; it was amazing to simply turn the screen to fit the content. In portrait orientation, the iPad is a full-page display, and its aspect ratio is correct. Its automatic reorientation makes it a descendant of the Radius Pivot. Now I want one even more. Paul Thurott article via Daring Fireball. Photo courtesy of Radius Pivot designer Terry Oyama. 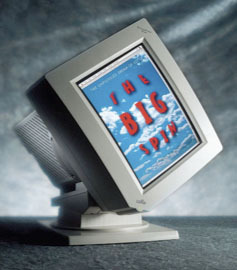 I had one of these, it was an excellent monitor. Unfortunately discontinued.